Finally, the mini album has reached my hands. Without further ado, I present to you the review. As you can see, they have returned to an Oh! 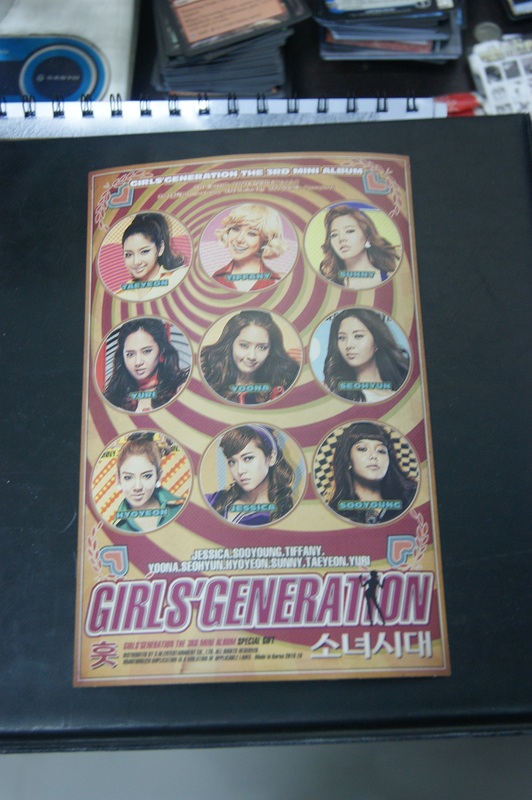 style booklet packaging. Except that this time, they got smart and stuck the CD on a little bit of foam to avoid cutting anyone’s face. Each of the girl’s faces can be peeled off individually, in case you are asking. This much is quite standard. 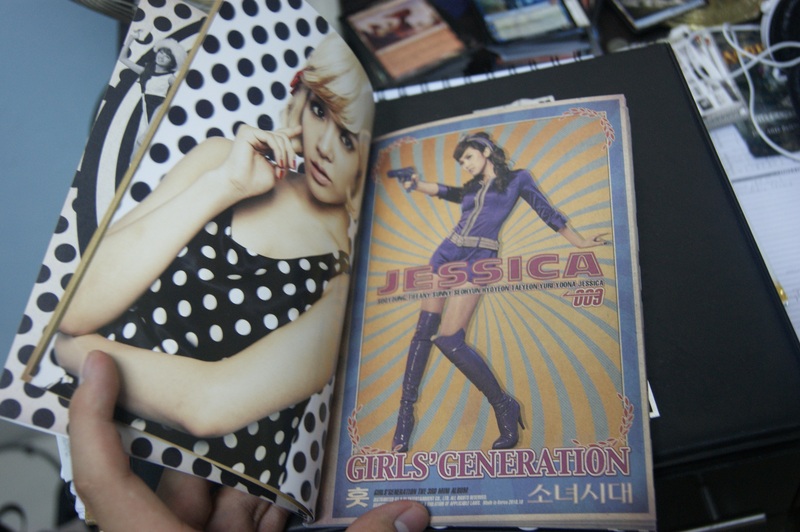 This includes the first page that consists of the group picture and the lyrics as seen here on the left of Tiffany’s page. The pages are unfortunately double sided. However, this means that for those of you who is going to buy more copies of the Mini Album to collect the cards, you would get more use out of your extra albums than its predecessors. Something, I feel is very thoughtful of SME this time around. Another thing to note about the pages is that one side of it is matte like the rest of the album, but the side with the polka dot background is glossy like the Everysing and SM Town Postcards. And if you paid attention, these pictures are not the same ones you see in the Teaser site. In short, Hoot has a unique concept to an album packaging which gets a lot of points with me. I like. This song is catchy without being sugary sweet like Gee, allows their vocals to shine unlike Oh!, combines the best qualities of Genie and RDR’s beats, and sounds perfectly at home in the intro of a Bond movie. This, dear Sirs and Madams, is SNSD’s finest song of the year. No, the rabid fans weren’t exaggerating. Much. What else needs to be said? The tune is awesome, the arrangement is brilliant, and the attitude the song exudes: It’s neither innocent and happy like Oh!, Gee, or ITNW nor is it dark and edgy like RDR. It is also unlike Genie where the general message was that the girls are out to grant people some wishes. Anyway, I have been looping this song for days on end now and I have not gotten tired of it yet despite it being repeated for about 8 hours total now. It’s that good. By now, I am sure you would have heard the raves about this song. The Korean lyrics were written by none other than Yuri and they are about the singer falling out of a relationship because she thinks that she did not put enough effort into “making you love me more” (As translated by Soshified). However, it also implies that the other person has moved on somewhat amicably and this is tearing our poor singer’s perspective up because the singer really (REALLY) loves him/her. This song has the message of regret, hence the title. Really good lyrics, if you ask me. Although, in the recent interview, Yuri said it’s about some unrequited crush or something. Maybe the translation lost some meaning? =O Or perhaps I am misreading the vibes from the lyrics. Ah well. Of course, by now you would also know that this song is not new. It is actually a cover of an English song: “Watching Over Me” by Jenny Hyun. Well, who knows (or cares) what the background of the song is, right? It’s a good ballad done in the same vein as Star Star Star. This is the song that Whee Sung wrote the lyrics for. If the title hasn’t already given the subject of the lyrics away, the song is about celebrating the joys of a close friendship. It has already been described as the SoShi Bond song, among other things and unsurprisingly, I think that this is by and away the best song in this Mini Album. Yes, I am contradicting myself with the statement on Hoot. But sue me. I like this one more than Hoot, but Hoot is technically better. It is the most upbeat song in the album, sung with a very light hearted feel (Possibly more so than Gee) and impressive vocals. You know what, I just realised that writing about this song will never do it justice. So, just go to Youtube and look for this song and listen to it if you haven’t already. This song sounds a lot like Run Devil Run and actually has those same vibes as well. So, if you liked RDR, you will like the tune here as well. The lyrics (SSF doesn’t have it up yet, so we are dealing with sketchy translations here) seem to be something about a girl griping about her control freak boyfriend. The singer seems to have acquiesced to his demands all this while because she thinks she is in love and should do anything that was asked of her (I think we have all been down this road before). Now, she’s having doubts and just wants to wake up from whatever it is is keeping her with him. Well, that’s the gist of what I am interpreting from this page anyway. Will update and correct as necessary once SSF posts their version. Anyway, this is another one of those SNSD songs voicing out dissatisfaction or threats or want to break up with a boy. Pretty good lyrics, if you ask me. And the melody is enjoyable, unlike some other SNSD slow-powerful-beat songs that I find absolutely horrible. Another familiar sounding upbeat song by our girls. The melody is pleasant and is reminiscent of such hits like Kissing You but like all the other songs on this mini album, our girls sound a lot better than before. Unlike most other “crush” songs by SNSD, this one is sung in a very light hearted mood, like the singer has just gotten the idea to sing about it and has not let the crush fester long enough to have any negative connotations. Heh. This mini album is actually worth the hype. 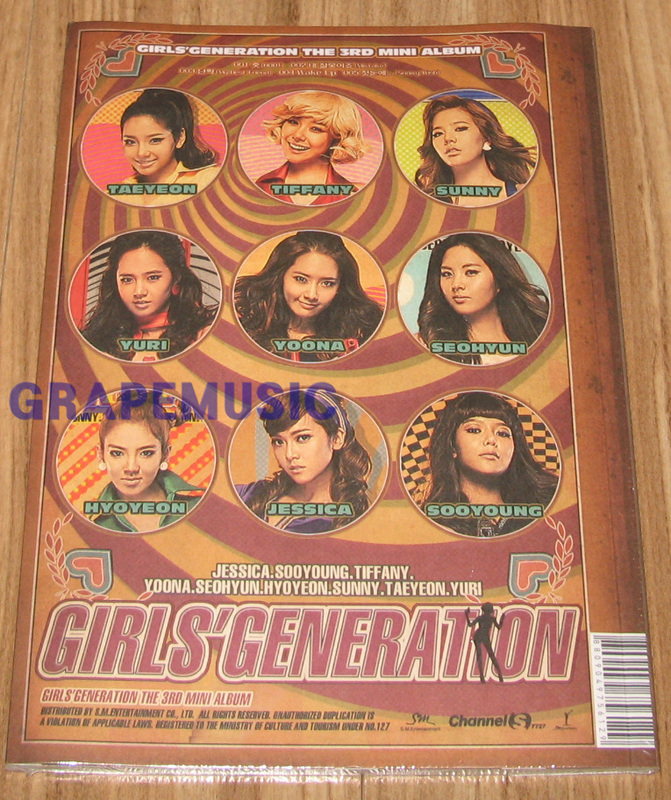 It is as good as some of the other, more rabid SONEs claim. Buy it. Heck, buy two or three copies so that you can have a set of pages stuck onto your wall on one side, another set for the other side, and one copy to keep it as is. I am not one for espousing buying multiple copies, but this one I am making an exception. Still waiting for mine to arrive 😉 ! Will definitely get another just to “use” the pages of the mini album 😀 ! Thanks for the review ! Cheers ! On the contrary, I find Wake Up to be a powerful song, both musically and lyrically.